Around the world, 4.5 billion people lack safely managed sanitation, and nearly 2.1 billion people drink unsafe water. If you stroll through the urban slums of Blantyre, Malawi, the landscape is dotted with pit toilets – like we used to have in rural America – that are prominently marked with a phone number. It’s not graffiti. If you call the number, you will reach an intrepid entrepreneur named John Matias. Like a growing cadre of Malawians, he has built a thriving business by collecting an unlikely commodity that is a valuable renewable resource: poop. The sanitation business has changed John Matias’s life. He grew up poor. As a child, his school uniform was so tattered that he was ridiculed, eventually forcing him to drop out of school. He later bounced around from job to job - herding goats, working in construction, cultivating tobacco – to name a few. This is a common narrative in Malawi, where many people live on less than $1 a day. At the same time John was searching for a career, Water For People, the Denver-based nonprofit that I lead, was trying to figure out the best way to provide sustainable on-site sanitation services in Blantyre. 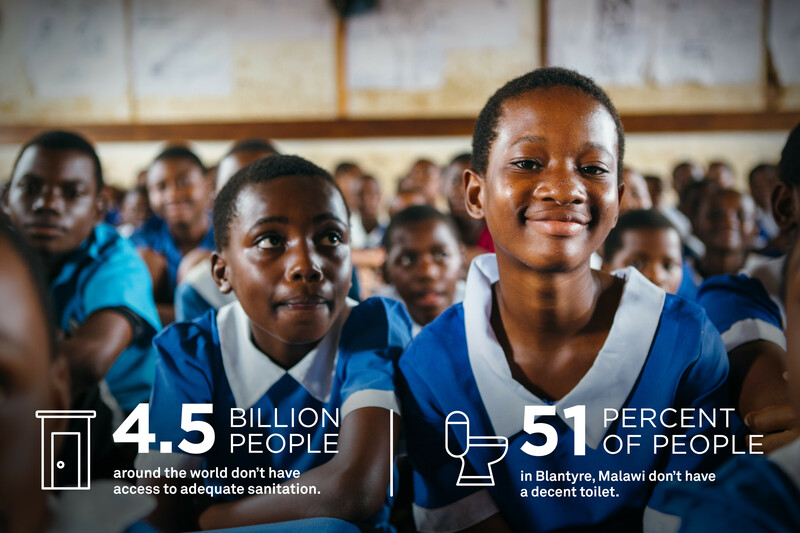 There are no sewers for people living outside the centre of the city, and only 49% of Blantyre residents have toilets that safely contain waste. Poor sanitation contaminates water, which often leads to diarrhea and other water-borne diseases. Blantyre is part of a global problem. Around the world, 4.5 billion people lack safely managed sanitation, and nearly 2.1 billion people drink unsafe water, often contaminated with human or animal feces. Water For People knew that market forces would be key to solving Blantyre’s sanitation problems. Because outdated sewer systems have not been expanded to meet the needs of the growing population, pit toilets are the go-to models for on-site sanitation. Safely emptying them and treating the waste are critical to protecting human health and the environment in highly populated areas. Emptying the latrines is difficult and dirty work – and an opportunity for entrepreneurs who don’t mind some dirty work to make a profit. We decided to work with local organizations to spark an ecosystem for sanitation services that allows market forces to solve the sanitation problem. Businesses could be built around the construction and emptying of pit latrines, and then transporting and safely managing the waste – sometimes using it to create briquettes for cooking fuel. The idea of “poop entrepreneurs” was born. Intrepid entrepreneurs like John Matthias have fueled a circular economy that solves a sanitation problem, reduces waste, and focuses on societal benefits. And there is job security as the population – and sanitation needs – in Blantyre continue to grow. “I was so desperate to start any business and when this opportunity presented itself, I couldn’t resist,” said John. He participated in an informational event offered by Water For People, and then attended business management and marketing workshops, completed technical training sessions on toilet design and maintenance, and developed and implemented a business plan. This hard work paid off. Despite the stigma that accompanies working with poop, John went from emptying two pit toilets a month five years ago to 15 per month today. To a certain extent, his good work sells itself. A neighbour sees a latrine being built that she knows can be properly emptied and she wants one too. John is also a shrewd marketer. He scrawls his telephone number all over his latrine work, and he is constantly taking and making calls – hustling for business as any good entrepreneur would do. He is part of a growing community of entrepreneurs who pair sanitation services with marketing savvy, and he now even has his own shop. “People used to laugh at me for emptying pit toilets, but those same people are now working for me!” explained John. He has a permanent team of five people – plus contract hires who help during busy times – and wants to expand his business to other communities. John – who cannot read or write – is earning $1,100 per month, a considerable sum by Malawian standards where the minimum wage is just over a $1 a day, and much more money than Blantyre’s traditional laborers and shop attendants earn. But business alone won’t solve everything. Local government and community groups need to support these market-based solutions to help them thrive through regulation and enforcement of violations of illegal dumping of waste. In Blantyre, the success of John and his fellow poop entrepreneurs has helped catalyze government action. John Matias has become an entrepreneur, an employer, a role model, and a leader in sanitation services. His example shows how market-driven solutions can create economic opportunities while solving vexing health and societal problems – all by putting poop safely in its place.